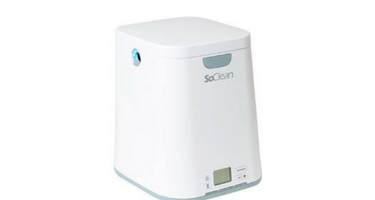 The SoClean 2 makes cleaning your CPAP equipment a breeze. An automated CPAP cleaner, the SoClean 2 channels activated oxygen to clean and sanitize, killing 99.9% of the CPAP bacteria, germs, and other pathogens. Featuring no water or chemicals, and zero disassembly, the SoClean 2 is the go-to, time-saving CPAP cleaner and sanitizer. Using a CPAP machine should be simple and straightforward, and so should cleaning one. Thankfully, the SoClean 2 takes all the confusion out of the CPAP cleaning equation. The SoClean 2 ditches the hassle of extra water or chemicals, and patients don’t even need to disassemble their CPAP equipment. But the best part is patients don’t have to fret about compatibility as the interior chamber accommodates a wide array of mask types and connects to most brands of CPAP equipment (an adapter may be required or recommended for a handful of select models [see note below]). The SoClean 2 is also compatible with most of the various iterations sleep apnea therapy, including CPAP, BiPAP and AutoPAP machines. The SoClean 2 harnesses the same technology used in hospitals to wipe out any CPAP bacteria, germs, and other pathogens hiding in your trusty CPAP equipment. Thanks to SoClean 2, you can rest assured that your CPAP therapy is keeping you breathing clean, fresh air all through the night. SoClean also backs up their product with a one-year warranty. Cleaning your CPAP doesn’t have to be complicated. After a simple one-time setup, just place your mask inside the chamber, close the lid and SoClean does the rest. It’s the world’s first automated CPAP cleaner and sanitizer. Using activated oxygen, SoClean eliminates 99.9 percent of CPAP bacteria, viruses and mold in your mask, hose and reservoir. No disassembly. No water. No chemicals. Just simple, automated cleaning. •Eliminates 99.9% of CPAP bacteria, germs, and other pathogens. •Check Valve – It is recommended to replace the check valve once yearly as a preventative measure. Save time and stop worrying about cleaning your CPAP mask, hose and humidifier today! The SoClean 2 takes care of everything automatically, with no fuss. Let your CPAP machine keep delivering a good night’s sleep, and let the SoClean 2 deliver peace of mind by ordering today at Sleep Direct.